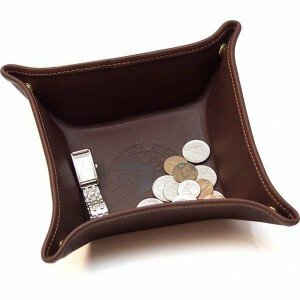 A perfect place to put keys, jewelry and coins while traveling. Folds out flat so it takes up no room in your luggage then snaps together to keep your valuables in one place. Available in brown or black leather. Alex Sez: People scoff when I show them my valet, but believe you me its an incredibly useful item to have. Put your watch, change, eyedrops, receipts, wallet, HOTEL key/ card, pocket knife, mini-flashlight. ANYTHING small that you need at the ready. Great for travel and extremely handy! A great accessory for travel. Holds your keys, watch, change, jewelery items, wallet, glasses, etc. Very durable. Thanks.